Granules, powder, flakes, balls, irregular materials, etc. Especially suitable for easily broken material. This machine integrates the functions of bag making, filling, sealing, printing, punching and counting, adopts double servo motor for film pulling and has automatic offset correction function. The cutter can adopt one of such three types – flat knife, serrated knife and dot dash line. The control components all adopt international famous brand products with reliable performance. Servo motor can be selected for transverse sealing mechanism with stable and reliable action. Patented anti-breakage technology, widely applied in quick freezing trade and its adjustment, operation and maintenance during the operation are very convenient. Can be used with various types of automatic metering equipments at home and abroad. 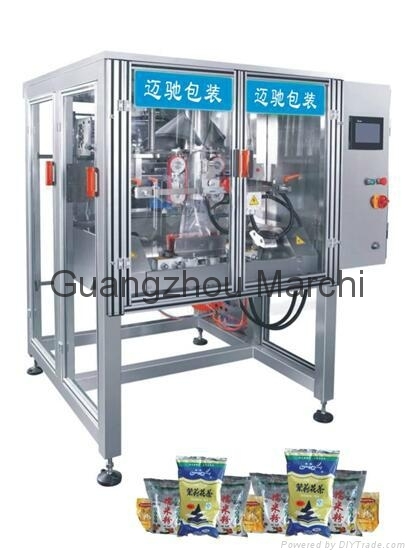 This packaging machine is of continuous packaging type without interruption of film pulling, thus realizing continuous film pulling and greatly improving packaging speed. Application︰ Granules, powder, flakes, balls, irregular materials, etc. Especially suitable for easily broken material.